April 11, 2019 at 9:05 pm. Forget the Tampa Bay Lightning’s 62-16-4 record en route to the President’s Trophy. The NHL Playoffs are called the second season for a reason. 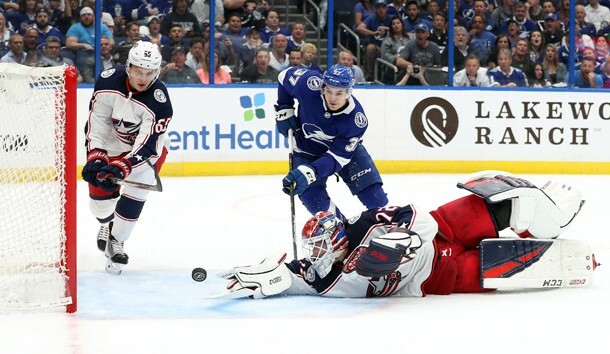 Wednesday night in Amalie Arena, there was a healthy reminder as the Columbus Blue Jackets scored three goals in the third period to battle back from a 3-0 deficit at the end of the first period to topple the Tampa Bay Lightning, 4-3, in Game 1 of the best-of-seven series. The Tampa Bay Lightning wasted little time giving the NHL and the rest of the sporting public what was supposedly going to be quick definition of why they won the President’s Trophy with 128 points, 30 ahead of their next closest challenger during the season. The Lightning came out with aggression and a physical presence in scoring three goals in the first 12 shots as they immediately put goalie Sergei Bobrovsky and the Blue Jackets on their heels. Just 4:12 into the game, the Lightning broke ground as Alex Killorn scored unassisted on the breakaway as he shoved the puck past the left blocker of Bobrovsky. Then Anthony Cirelli and Yanni Gourde pushed Tampa Bay to that quick 3-0 lead with markers coming at 11:01 and 17:50 respectively. Cirelli put back an Erik Cernak shot off the left side, while Jan Rutta fed Gourde for a slapshot between the circles. The Blue Jackets fought back as they were able to stabilize and midway through the second period Nick Foligno collected an errant puck and scored on a breakaway to cut the Lightning lead to 3-1 after two periods. Midway through the third period, the house started to collapse for Tampa Bay when the Blue Jackets’ David Savard cut the lead to 3-2 on a turnover in the Lightning zone as he went unassisted at 7:56. Then, 3:58 later Josh Anderson scored a short-handed goal to tie the game at 3-3. Columbus defenseman Seth Jones delivered the knockout punch for the Blue Jackets at 14:05 with his power play goal that crafted the 4-3 come-from-behind victory. He fired his wrist shot past Lightning goalie Andrei Vasilevskiy as it was his 12th game winner on 40 goals on the season. Meanwhile, Cooper thought the Lightning should have been more in defense mode with the 3-0 lead rather than looking to score the fourth goal right off the bat in the second period.